This is the effect Hastur wants. The only catch is that you need more Dreamlands cards, which should be reasonably easy due to both Seventy Steps and Cavern of Flame being in faction. Another neutral card that is really yellow. Could be tricky to get the bonus whilst everyone pays the "new" shinies, but long term this ones a keeper. Wow, this is a card that hastur NEED to play. A lot of their cards don't work in 75% of matchups due to terror and willpower, answer cards are needed in a competitive hastur deck and this is probably the best. There are so few good dreamlands support cards, and one is restricted, that I wouldn't be worried about this being switched off. 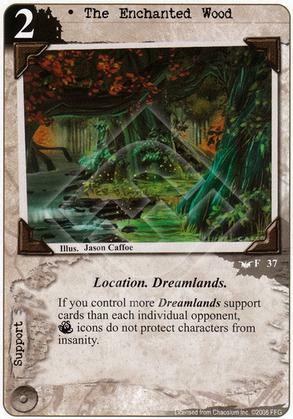 Almost all dreamlands support cards have the location subtype so be sure to pack some support/location hate.